SE Harold Street has been approved for an updated speed limit. Our maintenance crews will update the speed limit signs as time allows in coming weeks. Seven people were injured while walking at SE Powell & 136th Ave. between 2012 and 2016, among the highest number of pedestrian injuries of any Portland intersection. Our updated High Crash Intersections report now includes data through 2016 and identifies a total of 40 (up from 30) intersections with the most crashes involving people walking and biking. The three overall top-ranked high crash intersections are identical to last year's rankings: SE 122nd & Stark, SE 82nd & Powell, and SE 122nd & Division. Crashes involving people walking were most common at NW Burnside & 3rd, SE 82nd & Woodward, and SE Powell & 136th, and the greatest number of crashes involving people biking occurred on SE Hawthorne Blvd. at 7th and 11th Ave.
PBOT uses the intersections analysis to prioritize safety investments, which are noted for each location in the report. Our traffic safety engineers will evaluate intersections not already scheduled for safety fixes to determine an appropriate response. Reporter Andrew Theen recently profiled the previous year's rankings in this Oregonian article. What changes would you most like to see on 122nd Avenue? A PBOT project to make 122nd Avenue safer and provide better transit is seeking input via an online survey through August 15. 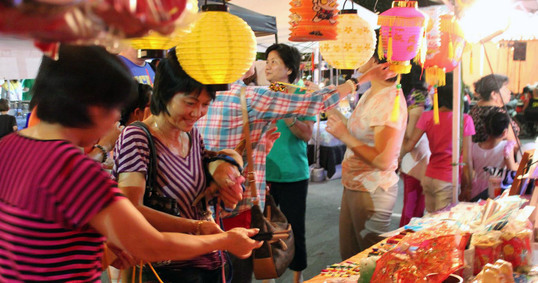 We're holding our next street team at the Jade Night Market on Saturday, Aug. 25, from 8:30 p.m. to 10 p.m. at SE 82nd & Division St. Join us by emailing Sharon White. Street teams are groups of PBOT staff and community members who talk with people about staying safe while walking, biking, and driving. Portland City Council approved a resolution on July 25 to adopt a list of street safety fixes for every school citywide, including 88 projects already funded for construction by Fixing Our Streets. New biking and walking facilities are nearly finished on N Lombard Street from Bruce Ave. to Columbia Blvd. Bike facilities will be extended later this year to Reno Ave.
Division Street: PBOT will install a new traffic signal at 125th Ave. and redesign the intersection at 148th Ave. this year, with more safety fixes slated for 2019. Foster Road: temporary striping is in place, construction of new crossings is underway, and construction is on track for completion by the end of 2018. Lombard Street: new walking and biking facilities are nearly complete between Bruce Ave. and Columbia Blvd., and new bike lanes will be constructed from Bruce Ave. to Reno Ave. by the end of 2018. Marine Drive: we expect the Army Corps of Engineers to sign off on plans for new signalized crossings and multiuse path infill soon, which will allow us to start construction this year. 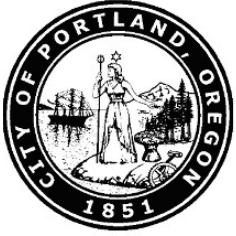 New parking guidelines approved on August 2 by Portland City Council help fulfill a Vision Zero action to reduce impaired driving. Vision Zero Action I.2 calls for encouraging impaired drivers to "leave their cars overnight without concern of getting a parking ticket or being towed." The new parking guidelines support this action by recommending a late morning (10 a.m.) parking enforcement start time in any new parking management districts. The new guidelines in the Parking Management Manual also clarify how to manage on-street parking on streets with many businesses. 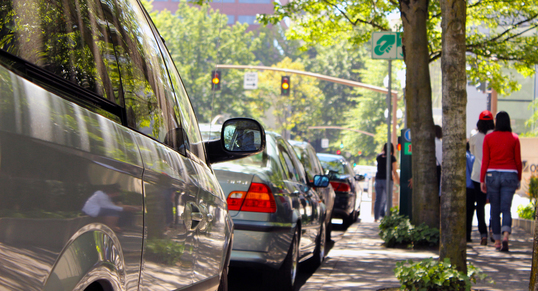 Parking revenues generated in meter districts help fund local area safety fixes such as sidewalks, curb extensions, crosswalks, and bike infrastructure, which support Vision Zero's use of street design to enhance street safety. Newly revised half-sheet flyers and brochures will soon be available for anyone wanting to share information about speed and other crash factors that most impact safety. The revised materials will replace the flyers and postcards currently available for request in multiple languages. 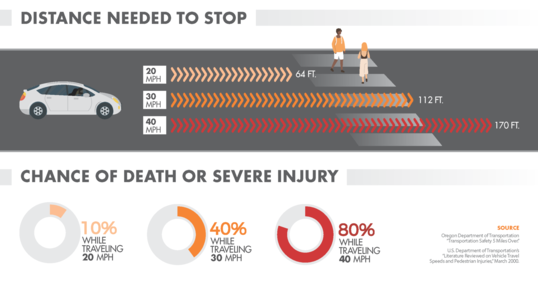 National nonprofit America Walks is highlighting Portland's efforts to support safe travel speeds. We'll discuss our work in the online discussion "Act Fast: The Growing Call for Slower Speeds," at 11 a.m. on Wednesday, Aug. 8. Local nonprofit and Vision Zero partner organization Oregon Walks is seeking an executive director with "a passion for pedestrian rights and a fierce commitment to equity." Oregon Walks helped create Portland's Vision Zero Action Plan and aids implementation through our Vision Zero Task Force. Oregon Walks is accepting applications for the executive director position on a rolling basis. The Oregon Department of Transportation is accepting applications through August 9, 2018, for a Region Traffic Safety Coordinator to work in their Portland office. The position is "responsible for providing expertise on behavioral elements of transportation safety to reduce critical traffic related injury rates." Vancouver's first citywide street safety analysis identified speeding, distracted driving, four- and five-lane streets, not using seatbelts, and alcohol as top factors associated with serious crashes. Roger Millar, head of Washington's Department of Transportation, highlighted safety in a recent keynote speech: "We accept death on the highway as a cost of business – that is appalling. Look at the cost of that. Congestion costs us $2 billion to $ 5 billion, but [roadway] fatalities and accidents have over $8 billion in impact. So safety is a bigger cost issue for us yet is the smallest of our programs." An analysis of North Carolina traffic stops found that, compared to white people, black people are twice as likely to be pulled over and about four times more likely to be searched, while Hispanic drivers are more likely to be searched relative to white drivers.